What is an Unlawful Absence from School? By becoming aware of and understanding the legal requirements concerning attendance and enforcement of compulsory attendance, parents will be able to work with school staff will be able to develop policies that are responsive to local concerns. Section A. is the revised Basic Education Circular that was developed to facilitate a consistent statewide approach to truancy and absenteeism reduction. Section E. is from Pa. Code, Basic Education Circulars, 24 P.S., Section 13-1301, which relates to enrollment of students. Educational success promotes workforce opportunity and development and builds a strong economic future for our state. The Pennsylvania Department of Education’s (PDE) goals are for every child to be known by name, be proficient or advanced in the core subjects, be graduates from high school, and achieve equitable outcomes regardless of background or ‘condition.’ The Commonwealth of Pennsylvania is committed to improving school attendance rates. In order for students to realize the opportunities and benefits from school, students have to not only be in attendance, but they must also be meaningfully connected to the school and experiencing success. To achieve this, there must be a collaborative effort across agencies, both at the state level and locally, to work with students and families to address the source issues that result in truant behavior. This BEC describes Pennsylvania law pertaining to pupil attendance and truancy and offers recommendations made by the PDE to encourage the adoption of proven truancy reduction efforts. This document also provides recommendations using national experience and best practices that have proven successful in reducing truancy. There should be a common understanding among school personnel that the initial responsibility to address truancy rests with teachers, principals and guidance counselors. School districts are advised to develop creative and innovative approaches to ensure that children are active participants in their education. Every effort should be made to keep youth in school and reduce the school district’s referrals to the courts, child welfare or juvenile justice systems in order to effectively intervene and eliminate truant behavior. Children are truant for many reasons and schools should seek to understand and address those issues. In Section IV (A)(3) of this BEC, the Department recommends that schools develop a School Attendance Improvement Plan (SAIP) as a means to address truancy. Section II of the BEC describes Pennsylvania’s law on attendance; Section III provides guidance for schools to use in working with partners to prevent truancy; Section IV outlines the recommended policy on truancy for districts to adopt; Section V addresses proceedings and penalties for violation of compulsory attendance requirements; and Section VI addresses charter schools. Compulsory school age refers to the period of a child’s life from the time the child enters school, which may be no later than eight years of age, until the age of seventeen or graduation from a high school, whichever occurs first. In the case of Commonwealth v. Kerstetter the Supreme Court of Pennsylvania that found a provision of the State Board of Education’s Chapter 11 regulations is inconsistent with the School Code. The court found that Chapter 11.13, which addresses compulsory school age, inappropriately commingled terms from two separate provisions of the School Code that addressed what the court ruled are distinct issues – compulsory school age & age of beginners. Section 1326 is the section of the Code that defines compulsory attendance and refers to “the time the child’s parents elect to have the child enter school….” However, in Chapter 11, the Board defines compulsory school age as the period of a child’s life from the time a child enters school as a beginner, which may be no later than age 8, until the age of 17 or graduation from high school. Chapter 11 further goes on to state that “a beginner is a child who enters a school district’s lowest elementary school grade that is above kindergarten.” Based on this section of Chapter 11, guidance historically has been provided that kindergarten students are not subject to the School Code’s compulsory attendance requirements. The court found that the inclusion of the term “beginner” in section 11.13 of the Board’s regulation improperly modified the statutory definition of compulsory school age. The effect of the court’s ruling is that if a parent voluntarily elects to enroll their child in a public kindergarten program, the kindergarten student will be subject to the state’s compulsory attendance laws. The Court did not offer an opinion on whether a parent can withdraw their child from kindergarten without being subject to truancy charges. The Court acknowledged this issue of “withdrawal and waiting” but since it was not a fact in the Kerstetter case the Court stated it was in no position to render a decision or opinion on this point. The State Board of Education recommended that PDE provide guidance on this issue and we now adopt and support the Board’s recommendation that parents or guardians who formally withdraw their child from kindergarten not be subject to compulsory attendance. Effective July 1, 2008, an amendment to section 2103(8) of the School Code granted the School District of Philadelphia the right to set the compulsory school age for students in the district at no earlier than age 6, with the exception of home schooled students who could continue to comply with the compulsory attendance age of 8 established for all other public school students in the Commonwealth. The child is 16 and has approval from the district superintendent. Attendance at a school operated by a bona fide church or other religious body which provides a minimum of 180 days of instruction or 900 hours of instruction per year at the elementary level or 990 hours per year of instruction at the secondary level. Privately tutored or home school students provided a minimum of 180 days of instruction or 900 hours of instruction per year at the elementary level or 990 hours per year of instruction at the secondary level. Children who are 16 and regularly engaged in useful and lawful employment during the school session with a valid employment certificate. The Department of Education’s opinion is that “regularly engaged” means 35 or more hours per week of employment. Children who have been examined by an approved professional and identified to be unable to profit from further public school attendance and excused by the school board. Children who are 15 who hold a permit approved by the school district to engage in farm work or domestic service in a private home. Children who are 14 and satisfactorily completed the equivalent of the highest grade of elementary school in their district who hold a permit approved by the Secretary of Education to engage in farm work or domestic service in a private home. The school district is responsible for monitoring and maintaining records of the attendance of students. All absences should be treated as unlawful until the school district receives a written excuse explaining the reason(s) for an absence. Parents/guardians and students should submit the written explanation within three calendar days of the absence and should be informed that if they fail to provide a written excuse within three days of the absence, the absence would be permanently counted as unlawful. The PDE recommends that schools immediately inform parents in writing upon each incident of unlawful absence. 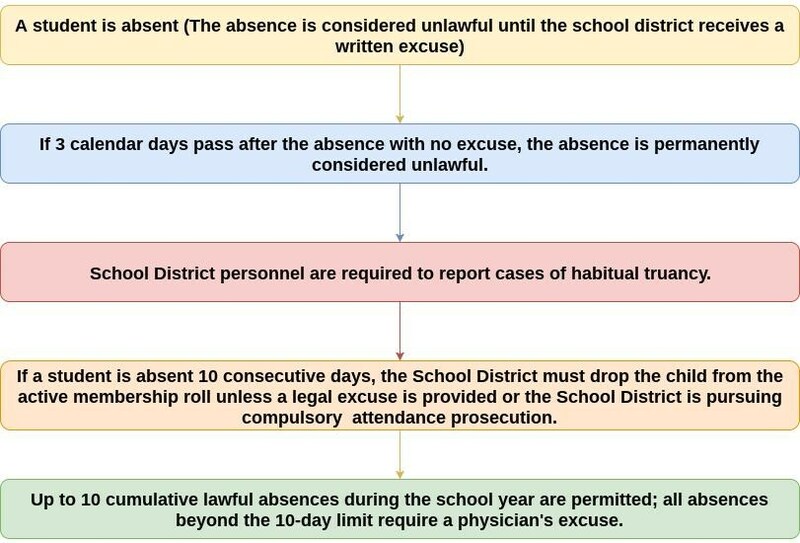 Pennsylvania law broadly defines absences as excused when a student is prevented from attendance for mental, physical, or other urgent reasons. Many school districts consider illness, family emergency, and death of a family member, medical or dental appointments, authorized school activities, and educational travel with prior approval as the only lawful absences. An absence that should not be categorized as unlawful is one in which a student who is involved with the county children and youth agency or juvenile probation office is required to leave school for the purposes of attending court hearings related to their involvement with these agencies. It is the responsibility of each district to determine the validity of excuses and have clear written policies regarding absences. Under Section 11.24, students who miss ten consecutive school days shall be dropped from the active membership roll unless the school is provided with evidence the excuse is legal or the school is pursuing compulsory attendance prosecution. Students of compulsory school age, who have not complied with compulsory attendance requirements, may be offered alternative education services or other provisions of education. Students are entitled to a free public education until the age of 21 years of age or until they receive a high school diploma, whichever occurs first. Illness verified by a physician's note submitted within three days of a student's return to school. Any absence in which a physician's note is submitted is not included in the 10 days permitted for parental excuses in middle and high school or the 14 days permitted for parental excuses in elementary. Death in the family - from the date of death until two days after the funeral unless otherwise authorized by building principal or his designee. A signed parental note must be submitted within three days of the student's return to school. Designated religious holidays provided that a signed parental request is submitted prior to the holiday. Pre-approved college visits up to three days per school year provided that a signed parental request is submitted prior to the visit(s). Pre-approved family vacation(s) while school is in session for up to five total days or two separate occasions within a school year. Pre-approved college visits beyond three days within a school year. Any absence for which a written parental excuse is submitted within three days of the student's return to school. For elementary students, a maximum of fourteen (14) days of cumulative absence verified by parent notes will be permitted during a school year. All absences beyond the fourteenth day will require a physician's note. For middle school and high school students, a maximum of ten (10) days of cumulative absence verified by parent notes will be permitted during a school year. All absences beyond the eleventh day will require a physician's note. Any day of absence for which neither a written parental or physician's note is submitted within three (3) school days of a student's return from absence. Any day of absence not excused by a physician's note after 10 days of secondary school absence or 14 day elementary school absences. School truancy which includes any unexcused or unlawful absence by students aged 16 and under or any unexcused absence by students aged 17 and over. Three unlawful absences will result in parent receipt of a written notice of violation of the Compulsory Attendance Law and may result in prosecution before a district justice in accordance with Section 1333 of Pennsylvania School Code. A written notice will also occur for all subsequent absences. Parents and guardians are subject to fines of up to $300 and possible arrest. Students may also have their driving privileges delayed or suspended. It is the Parent/Guardian responsibility to insure that the school receives written excuses within the required time period of three days after absence. Unlawful class absences exceeding 50% or more of any day will be classified as an unexcused/unlawful absence for the day. All students who arrive after 11:00 a.m. will be considered a half day absent. Unlawful and unexcused absences will result in a grade of "F", "N", or "zero" for all school responsibilities class work missed on that day. Late to class and late to school are categorized as attendance infractions of the Student Code of Conduct. Lateness to school due to physician's appointments, court appearances, or funerals are not subject to action outlined in the School Code of Conduct provided written verification is submitted when the student reports school. First and second unexcused late to class - to be addressed by classroom teacher intervention. Unexcused lateness exceeding 50% or more of one class period will be considered an unexcused absence from class and will result in a "0" (zero) grade for the work in that class on that day. All students who arrive late and do not report to homeroom or procure a late slip from the office, student service center, or vocational-technical school will be charged with an unexcused/unlawful absence which will result in a "0" (zero) grade for all class work that day. Late to class and late to school will result in administrative discipline referral upon the third occurrence. Unexcused class absences will result in administrative discipline referral upon the first occurrence. When a student has committed three attendance violations of any combination of late to class, late to school, unexcused class absences, the next violation will be considered an act of defiance. When a student has committed six attendance violations of any combination of late to class, late to school, unexcused class absences, the next violation will be considered an act of insubordination. Students who fail to report for unexcused reasons to administratively assigned detention for an attendance violation will be considered guilty of defiance. Continued attendance violations may result in the student being classified as a habitual offender as defined Student Code of Conduct which may result in expulsion from the District. A schedule modification may be imposed in cases where attendance infractions primarily affect a particular course of study. Students withdrawn from courses are ineligible to earn credits for such courses during the current school year. Sharing and reviewing school policy on attendance and student responsibilities with students and families. Pursuant to the BEC 24 P.S. 13-1327, schools are required to notify the parent/guardian regarding the need for a joint conference upon the third unlawful student absence. The school-family conference engages all participants involved in the student’s life to explore possible solutions to increase the student’s school attendance. Maintaining open communication between the student and adults will facilitate positive outcomes. The purpose of the school-family conference is to discuss the cause(s) of the truancy and to develop a mutually agreed upon plan to assure regular school attendance. The school-family conference provides both parties with the opportunity to identify, understand and explore all issues contributing to the student’s truant behavior. Participation by the student and family is an integral component for this conference. In addition, representatives from relevant and/or involved community-based agencies, community and school services and school personnel should be invited to participate. During the school-family conference, a SAIP shall be developed cooperatively with the student and other meeting participants as described in Section IV (A)(3) BEC 24 P.S. 13-1327. PDE recommends that a notice be sent to the parent/guardian after each unlawful absence. See Section IIC, page 3, for a definition of unlawful absence. Specific recommendations for each notice and step are found below. PDE recommends that unlawful absences do not trigger a formal response until the district has exhausted all efforts to work collaboratively with the parent/guardian to address the truancy of the student and until the student has three unlawful absences over the course of the school year. Schools are a critical part of a child’s support system and have a significant opportunity to assist children and families. Parent/guardian receives a notice of unlawful absence from the school district. The legal penalties established by law for violation of compulsory attendance requirements should be attached to the notice (see sample notices in Attachment). In addition to stating the legal punishments, the name and telephone number of a school contact person shall be included. Parents are then able to contact a specific person to request assistance in resolving the child’s truant behavior. Parent/guardian receives a second notice of unlawful absence from the school district. Once again, the legal penalties established by law for violation of compulsory attendance requirements and the name and telephone number of a school contact personal shall be included. Additionally, another offer of assistance should be made to the parent. Parent/guardian receives a third notice of unlawful absence by certified mail providing “official notice of child’s third illegal absence.” Attached to this notice will be penalties for violation of compulsory attendance requirements as they pertain to both the student and the parent/guardian, including information that three days after giving such notice, the student or parent/guardian who again violates the compulsory attendance requirements shall be liable without further notice. School districts shall coordinate a school/family conference to discuss the cause of the child’s truancy and develop a mutually agreed upon) to resolve truant behavior. Issues to be reviewed at the school/family conference include the appropriateness of the child’s educational environment, current academic difficulties, physical or behavioral health issues, and family/environment concerns. At the end of the conference all parties should sign a comprehensive SAIP that is agreed to by the school representative, the child, and the parents and/or family. The plan could include accessing academic and social/health supports from the school and community organizations, an outline of family/parent and student responsibilities, and levels of performance monitoring that include rewards and consequences. parent/guardian that the child has violated the SAIP or, if there is not a SAIP, to inform the child’s parent/guardian that the child has again violated the compulsory attendance requirements, and advise the parent/guardian that a citation will immediately be sent to the magisterial district judge. To ensure the parent/guardian receives the notice, it is recommended that such a notice be sent through certified mail. After this step, the school is not obligated to inform parents in writing of absences but it is recommended that the school continue to call the parent/guardian to inform them of additional truant behavior. Schools should refer all future incidents of truancy directly to the magisterial district judge having jurisdiction in the region. The School Code defines habitually truant as absence for more than three (3) school days or their equivalent following the first notice of truancy given after a child’s third unlawful absence. Completing a parenting education program, and in cases where the party convicted fails to pay the fine or complete the parenting education program, a subsequent sentencing to the county jail for no more than five days.